It’s early December and I’m sitting in a quiet Parisian restaurant with my old friend Kate. 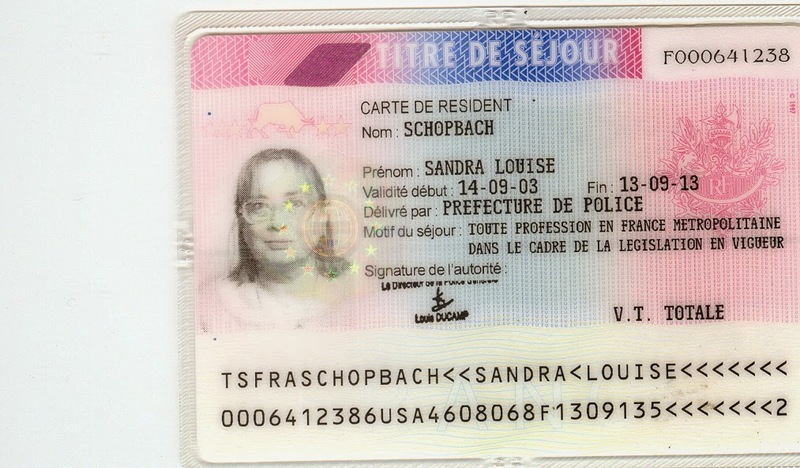 She asks me something about my carte de séjour, France’s version of a Green Card. And when I look at it, I discover that I’ve been living in France illegally for.. 18 months! May 15, 2015 is when my passport expires, not my carte de séjour. The next morning I call the Préfecture de Police, the authority who handles resident permits, and confess my sins. “Oh là là!” the woman says. “Oh là là!” is not something you want to hear from the Préfecture de Police. She grants me “the first available appointment”, which is... three months later. And tells me to go to a particular office at a particular time to get an extension. Three months later, after the cold I caught in the rain has cleared up, I sign in for my appointment at the Préfecture de Police. The lady at the front desk looks at my card and says “Oh là!”. I tell her that’s one “là” short of what I had been told over the phone. Which is how I become known as Madame Oh-là-là from that point on. And I ask why weren’t those documents indicated on the paper sent out (by the same person who told me to go to that totally unnecessary office where I caught my cold). Antoine says he doesn’t know. But to come back as soon as I can get them together. Which is the next morning, at the opening of the carte de séjour office. After waiting for an hour with the other victims, the Front Desk Lady calls for Madame Oh-là-là and says “Antoine. Counter 4". I know where that is. I was there only hours ago. Antoine congratulates me for my speed, then starts going through my papers (originals + 1 xerox). And comes to a grinding halt when he sees that one of my bank accounts is sent to my U.S. address. “Oh, that’s not good.” he says. And I say “Oh-là-là!” He commends me for keeping my sense of humor... and calls in his supervisor. Whose name is Béatrice. Béatrice asks me a lot of auxiliary questions, the answers to which are to her liking. She gives me a list of further documents to add so that the sin of having an address in the United States can be forgiven, and tells me to write a letter explaining all that I’ve just explained to her and Antoine. For the second time, I make a round-trip back up that steep hill to Montmartre. Instead of lunch, I write my mea culpa on plain paper instead of on the blackboard, find the other documents, plus some more that will show that I’ve been residing in Paris during those 18 (now 21) lost months. In my letter, I even quote Josephine Baker, who sang “J’ai deux amours: mon pays et Paris” (I have two loves: my country and Paris), and generally throw in a lot of sturm und drang to tug at whatever heartstrings the Ultimate Supervisor and Signer of Green Cards may have. When I show up for the third time in 24 hours, Front Desk Lady greets Madame Oh-là-là with a smile. She passes on the papers to Antoine, who tells me it doesn’t look good. His supervisor Béatrice peeks her head around the corner and says that she’ll plead my case with her superior. They try to convince me to come back another day. I tell them I have a book to read and don’t mind waiting the one or two hours more they estimate it will take. Which is pretty much what it does take. Postulant by postulant, people sit in the cubicles and then leave. After a while, it’s just me and a South American lady, both waiting for the same thing: the right to live in Paris as legal residents. Should I lose that status, I’ll have to close all my bank accounts and open non-resident accounts, with all the nit-picking that requires. I’ll have a one-year pass only. And most importantly, I’ll lose my health coverage, which I paid into for decades... to the tune of 11% of all I ever earned. As the clock moves slowly, Senorita Supplicant is finally called into a cubicle and leaves. There's only me now. The clock is poised at almost 5 pm. Closing time. Béatrice reappears. Madame Oh-là-là is told to go back to cubicle 4 again, which has almost become a home-away-from-home. Antoine tells me that I’ve been lucky. Béatrice has pled my case. Her supervisor didn’t want to renew my card. He was adamant. Said I was cheating and should be punished. Béatrice told him he’d been renewing cards even for the homeless and here I was with two French children, three French bank accounts, an apartment that I owned, and having paid into The System for 30+ years. Surely that was basis for residency. And I guess he blinked. The last problem is that my fingerprints are to be taken digitally (a new touch since the last time ten years... I mean 11 ½ years ago.) And the machine doesn’t want to work. A second try. And a third. As all Antoine’s colleagues who haven’t already left look on - their coats, hats and gloves on because it’s 5 pm and the office is closed and they’re bureaucrats - Antoine tries another machine and... it works! So now a) we can all go home, b) none of them has to see me again for 10 years, and c) I have a legal document that states that I am indeed in France legally. Champagne is in order. The sky is blue. I go around the corner to Notre-Dame Cathedral because it feels like someone needs to be thanked, even though I’m not Catholic. And then I go across the bridge and lose myself in an exhibit of the photographs of the Magnum News Agency. It’s been a long 24 hours. In March I was told that my carte de séjour would be ready three months later, as of May 27th. Given all the problems then (see above), you can bet your booty that I was there on Wednesday, May 27, and no later. First you pay the cashier, who in return gives you some stamps of varying denominations that you take with you to the office opposite. Well, actually, you take a number outside the office and you wait until you’re called in. The girl behind the counter asks to see my documents, examines the stamps (doing the math in her head), gets up and disappears into the file room. When she comes back, she announces... it’s not there. “Can they send it here?” I ask. Given how ludicrous this whole thing has been from the very start, I thank her and decide to go back to the office where all the Sturm und Drang played out in March, just to say hello and share this latest chapter of The Saga with them. There are many, many victims seated there, waiting their turn. The lady behind the desk recognizes me; I am Madame Oh-là-là. “So... you have your carte de séjour.” she assumes. I tell her the story and she asks to see the paperwork. I tell her it’s all right. She insists. I hand her the paperwork. She turns to her computer, clicking on this and that. I point to the last cubicle on the left. She gets up and disappears in the general direction of Antoine, Counter 4. When she comes back she says, “Antoine apologizes and admits he’s the spiritual son of Darth Vader.” Translation? Antoine keyed it in wrong. He’s the mystery mis-coder. Of course it is understandable, seeing as he was still fingerprinting me at 5:02 while all his fellow cubicle-rats were standing by the door in their coats and gloves, waiting for him to finish with me so they could close up shop and go home. So now, thanks to Darth Vader Jr., I’ll be going to the Bastille neighborhood on my quest for the Holy Carte de Séjour at the Annex on the street that used to lead to the women’s prison. I hope they won’t keep me. Immediately after a visit to the melon-squasher for a mammogram, I arrive at the Annex, only to be told it’s closed. For lunch. An hour and a half long lunch. That wasn’t information I was given yesterday. No lunch break warning was issued. This is not going well. But that seems to be the general drift of this quest so far. So I decide to go on another quest: one for the long-lost French ancestor of a friend, a soldier who came with French troops to help the Americans win their independence in 1781. But that’s another story to be told in another day’s blog. Suffice to say, it filled more than the hour-and-a-half lunch hour. When I get back to the Annex, there are about a half dozen people in line in front of me. The Brazilian woman who precedes me leaves angry and in tears, having fought - and lost - an administrative battle with the lady behind the desk. I go in, all smiles, hoping the clerk will not take it out on me. And finally, in spite of a surprised “Oh!” that she utters when she looks at the card - false alarm - I walk out of the building, my carte de séjour in my hand, no mistakes on it, valid for ten years. The Quest has ended. And it only took six months. March is a time of melting, as my webmaster reminded me. Melting snow mainly in the north of the United States, where I spend the non-France part of my life. And after this past finger-numbing Michigan February, I certainly hope he’s right! So it seemed logical that March would be the month of fondue. The word fondue comes from the French fondre, which means to melt. And there will be a lot of melting before you can dig in. Or rather dip in. In France, there is fondue bourguignonne (with meat) or fondue savoyarde (with cheese). Savoie was an independent region annexed by France in 1860, which is very recently. It’s in the Alps, near Switzerland - and thus the cheese, I guess. 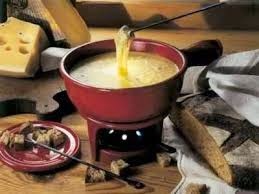 The Swiss used fondue as a way to make it through the winter on little money, stale bread and hardened cheese. Now it’s become a pretext for a fun party, because anyone who loses his or her crust of bread in the cheese will have to a) buy the next bottle of wine, b) kiss his/her partner, c) perform a “trick” such as singing a song or telling a joke, and just generally getting teased a lot. You can start getting ready in advance by cutting the cheese into very small pieces or shredding it. It will melt more smoothly than if you grate it. Then cut up some small loaves of hard-crust “French”-style bread, leaving two sides of crust because if you lose your bread... well, see above. The drier the bread, the better, so if you have a lot of bread left over from a party, this is an excellent opportunity to use it up. Remember, the Swiss dunked their bread because they weren’t wasteful; how do you think the country got so rich? Kirsch (cherry brandy) is the traditional Swiss choice of brandy for a fondue. You can use cognac, light white rum or even hard cider. Or maybe a Poire William pear brandy from Alsace? - Begin by heating the white wine over direct low heat until air bubbles start to rise to the surface. NEVER BOIL THE WINE! - Right away add the cheese, a handful at a time and stir with a wooden spoon. And stir. And stir. Until the cheese is melted. Then add another handful. And stir. - When all the cheese is melted, add the cornstarch diluted in the brandy. Add salt and pepper to taste, and a dash of nutmeg (freshly grated, if possible). - Cut a large clove of garlic in half and thoroughly rub the inside of a round earthenware pot for an added layer of flavor. For cheese fondue, you use an earthenware pot, called caquelon (pronounced “kah - keh - lo”); the metal ones are for the hot oil of meat fondue. - Pour the cheese fondue into the caquelon and light it up. Use a sterno or other type of fuel heat; candles won’t keep the cheese warm enough. - At the end you’ll have a rich brown crust on the bottom of the caquelon. This is considered “the best part” and it can either be divided up or awarded to the one who didn’t lose their bread. Should the cheese get too thick, stir in a little wine. If it separates or gets lumpy, put it back on the burner, stir in ½ t of cornstarch blended in a bit of warm wine and stir it with a wire whisk.